Researchers have explored whether certain combinations of macronutrients more effectively manage the disease, but does a perfect eating plan exist? To say that dietary prescriptions for diabetes have varied over the last hundred years is an understatement. From the very–low-carbohydrate diets initiated before insulin was discovered and used therapeutically to the high-carbohydrate, high-fiber vegan diets endorsed today by some medical researchers, recommendations for optimal macronutrient intake for both type 1 and type 2 diabetes have covered nearly every conceivable option. Good scientific studies have identified a number of specific components in foods that may improve clinical diabetes outcomes and others that likely accelerate the pathogenesis of the disease. Yet, the optimal diet profile—the best balance of carbohydrate, protein, and fat—remains a topic of serious debate. The following review will touch on the primary therapeutic diet patterns for diabetes considered today and some of the data that either support or refute their effectiveness in reducing hyperglycemia, promoting long-term weight loss, and reducing the risk of cardiovascular disease, the most common cause of death for individuals with diabetes. The 2008 American Diabetes Association (ADA) position statement, as reported in Diabetes Care, notes that “although numerous studies have attempted to identify the optimal mix of macronutrients for the diabetic diet, it is unlikely that one such combination of macronutrients exists.” Rather, the ADA indicates, the best mix of carbohydrate, fat, and protein varies depending on an individual’s circumstances, caloric needs for weight control, and specific metabolic status (eg, lipid profile). With the previous considerations in mind, the ADA does make some specific nutrition recommendations for weight loss, glycemic control, and the prevention of diabetic complications (see sidebar). Low-fat, calorie-restricted diets are traditionally recommended for weight loss. However, the ADA notes that low-carbohydrate diets (less than 130 g carbohydrate/day) may be effective for weight loss in the short term (ie, less than one year). Whether such diets sustain weight loss and support optimal lipid profiles over the long term remains to be determined. Evidence suggests that after one year, the difference in maintained weight loss between low-carbohydrate or low-fat diet patterns is insignificant.1 In addition, a meta-analysis published in the Archives of Internal Medicine in 2006 found that some individuals had elevated LDL levels when following a low-carbohydrate diet. Long-term effects of low-carbohydrate/high-protein diets on kidney function are also undetermined. Because very–low-carbohydrate diets can eliminate important nutrient- and energy-dense foods, the ADA maintains that the long-term benefits and metabolic effects of low-carbohydrate diets remain unclear. A study by Barnard et al published this year in The American Journal of Clinical Nutrition compared the effects of a low-fat vegan diet (less than 5% saturated fat, 10% total fat, 15% protein, and 75% carbohydrate) and a conventional diabetes diet following 2003 ADA guidelines (less than 7% saturated fat, 15% to 20% protein, 60% to 70% carbohydrate and monounsaturated fat, and less than 200 mg/day cholesterol) on glycemic control, weight loss, and plasma lipid levels. Individuals following the vegan diet ate an average of 22 g fiber/1,000 kcal/day, while those adhering to ADA guidelines consumed approximately 14 g/1,000 kcal/day. The actual trial lasted 52 weeks, but researchers followed the participants for 22 weeks afterward to assess long-term effectiveness of and adherence to the diets. At the end of the extended observation period, researchers found that both diets were associated with modest sustained weight loss (-4.4 kg in the vegan group vs. -3 kg in the conventional group), as well as comparable reductions in hemoglobin A1c. However, more individuals in the vegan group were able to reduce medications. After controlling for these medication changes, significantly greater reductions were seen in A1c and total and LDL cholesterol concentrations in the vegan group. A particularly interesting outcome was the greater reduction of triglycerides in the vegan group compared with the conventional group (-33.9 + 12.7 vs. -7.8 + 28.9). These results contrast with previous studies finding elevated triglycerides in high-carbohydrate diets.3,4 Barnard et al argue that the participants in previous studies were not encouraged to consume most of their carbohydrates from high-fiber, low-glycemic index foods. Refined, carbohydrate-dense foods that are low in fiber are more likely to raise triglyceride levels. Weight loss was also cited as having an effect on lipid levels in this study, as was the ability of participants to self-regulate their caloric intake on either diet. Another macronutrient pattern considered for diabetes is the high-monounsaturated fatty acid (MUFA) or Mediterranean-style diet. The ADA recommends a diet that provides 60% to 70% of calories from a mix of carbohydrate and monounsaturated fat. Gerhard et al attempted to determine the optimal energy distribution from MUFA and carbohydrate in the diabetic diet in a study published in The American Journal of Clinical Nutrition in 2004. This study was very small (only 11 subjects) but yielded interesting results. Researchers found that a low-fat (20% of calories from fat) vs. a high-MUFA diet (40% of calories from total fat, 26% MUFA) resulted in more weight loss and improved triglyceride levels. Glycemic control did not differ significantly between the two groups. The low-fat diet was higher in fiber and contained foods with a lower caloric density than those in the high-MUFA diet. Subjects in this study were also allowed to self-regulate their intake. The authors suggest that when individuals are allowed to regulate their intake according to satiety, a low-fat, high-fiber, high-volume diet may have advantages for weight loss (but not necessarily glycemic control) over a high-MUFA diet. 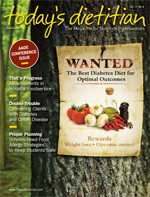 A more recent study published this year in Diabetes Care found no significant difference in outcomes (weight, lipid levels, and glycemic control) between two groups consuming either a high-MUFA or high-carbohydrate diet over one year. Both groups had modest weight reductions over 52 weeks (approximately 4 kg) along with improved lipid, blood pressure, A1c, and fasting glucose levels. No detail was offered regarding the fiber content or glycemic index of the carbohydrate-dense foods that participants consumed. The authors of this study concluded that both low-fat and high-MUFA diets provide clinical benefits to individuals with type 2 diabetes. The ADA position statement names low-carbohydrate diets as a viable alternative for weight loss in the short term. Low-carbohydrate diets have been defined as providing anywhere from 50 to 150 g carbohydrate/day.6 Weight loss is believed to occur not when individuals replace carbohydrate with fat or protein but when deficits in appetite cause a drastic reduction in caloric intake from high-carbohydrate foods. Still, questions about the sustainability of the diet and long-term effects on lipid profiles, glycemic control, cardiovascular disease, and kidney function remain. Some scientists are now considering diet/genome interactions to explain differences between individual glycemic responses to food. Apparently, a number of genetic factors may influence how an individual reacts physiologically to his or her dietary pattern. For example, a gene implicated in diet/genome interactions is Rad.7 In experiments with mice, Rad overexpression caused mice eating a high-fat diet to become more insulin resistant and glucose intolerant than normal mice eating the same diet. Rad overexpression has been identified in humans, and this finding suggests that a high-fat diet may have a more profound impact on glucose homeostasis in some individuals.7 Genetic studies may eventually provide a way to fine-tune individual diets for optimal glycemic control and improved clinical diabetes outcomes. So what is the optimal macronutrient balance in a diet for someone with diabetes? It appears that low-fat, high-fiber diets may be more effective than low-carbohydrate diets over the long term for sustaining weight loss and improving clinical diabetes outcomes (eg, lipid profile, glycemia). This may also be true of low-fat vs. high-MUFA diets. The bottom line is that no one can truly say which diet is best. One of the biggest barriers to determining the ultimate diet profile for individuals with diabetes is likely the lack of consistency in study design and size. Not all studies encourage the intake of unrefined, carbohydrate-dense foods that are high in fiber or rate low on the glycemic index scale. Cohort sizes are often very small. Observation time can range from three to 72 months or more. Most studies also rely on the diet recall of free-living subjects to determine compliance with dietary prescriptions or establish intake patterns. Feeding subjects a controlled diet in a controlled environment would yield more accurate results, but this is usually not feasible or affordable in a study lasting several months or years. Considering the circumstances and metabolic profile of each individual before suggesting a dietary pattern for diabetes is likely still the best practice. • Either low-carbohydrate or low-fat, calorie-restricted diets may be effective strategies for weight loss in the short term. • Monitor renal function, lipid profiles, and protein intake (in patients with nephropathy) and adjust hypoglycemic therapy as necessary for those following a low-carbohydrate diet. • Monitoring carbohydrate is a key strategy for achieving glycemic control. • Patients with diabetes should consume an assortment of fiber-containing foods and attain the USDA dietary fiber recommendation (14 g/1,000 kcal). • There is not enough consistent, sufficient evidence to prove that low-glycemic load diets reduce diabetes risk. For diabetes management, the use of the glycemic load/index may provide an added, though modest, benefit over that observed when only total carbohydrate is considered. • Limit saturated fat to less than 7% of total calories and minimize trans fat intake. • For good health, include carbohydrate from fruits, vegetables, whole grains, legumes, and low-fat milk in the diet. — Adapted from the American Diabetes Association. Nutrition recommendations and interventions for diabetes. Diabetes Care. 2008;31(Suppl 1):S61-S78. 1. Gardner CD, Kiazand A, Alhassan S, et al. Comparison of the Atkins, Zone, Ornish and LEARN diets for change in weight and related risk factors among overweight premenopausal women: The A to Z weight loss study: A randomized trial. JAMA. 2007;297(9):969-977. 2. Franz MJ, Bantle JP, Beebe CA, et al. Evidence-based nutrition principles and recommendations for the treatment and prevention of diabetes and related complications. Diabetes Care. 2003;26 (Suppl 1):S51-S61. 3. Barnard ND, Scialli AR, Turner-McGrievy G, Lanou AJ, Glass J. The effects of a low-fat, plant-based dietary intervention on body weight, metabolism, and insulin sensitivity. Am J Med. 2005;118(9):991-997. 4. Nordmann AJ, Nordmann A, Briel M, et al. Effects of low-carbohydrate vs low-fat diets on weight loss and cardiovascular risk factors: A meta-analysis of randomized controlled trials. Arch Intern Med. 2006;166(3):285-293. 5. Chavez JA, Summers SA. Characterizing the effects of saturated fatty acids on insulin signaling and ceramide and diacylglycerol accumulation in 3T3-L1 adipocytes and C2C12 myotubes. Arch Biochem Biophys. 2003;419(2):101-109. 6. Westman EC, Feinman RD, Mavropoulos JC, et al. Low-carbohydrate nutrition and metabolism. Am J Clin Nutr. 2007;86(2):276-284. 7. Dedoussis GV, Kaliora AC, Panagiotakos DB. Genes, diet and type 2 diabetes mellitus: A review. Rev Diabet Stud. 2007;4(1):13-24.